It’s almost winter and that means it’s stuffy nose season. Colds, flu, dust, even allergies can all cause a miserable stuffy nose. But it could be something else, too. Something that’s supposed to help, not make it worse. While no one wants to talk about mucus, if you’ve got a stuffy nose, you’re thinking about it. And as unappealing as it is when you’re sick, mucus is actually an important part of your body’s defenses. It keeps your sinuses from drying out. It captures foreign containments like dust and dander before they can get into your system. It even contains antibodies that help protect you and keep you healthy. The most common causes of stuffy noses are the ones you think about every stuffy, sniffly day: infection, allergies, and inflammation. And all three of them can cause a build-up of mucus and that can lead to a stuffy nose. Generally speaking, mucus is clear. But that doesn’t mean you should be concerned if it’s not. Mucus can turn the color of the particles it picks up, even black and gray. The only time you need to be really concerned is if it’s dark red, because then it could be a serious infection that’s causing bleeding. But of course, if you’re ever concerned about your stuffy nose, you should see your doctor. You may feel like being unproductive when you have a stuffy nose, but it means something different in this context. When talking about congestion, your sinuses being productive means you are able to produce the mucus and remove it from your body. So, being unproductive means you are unable to produce and remove the mucus. In other words, you blow and blow and nothing happens. That’s because your stuffy nose isn’t being caused by congestion, it’s being caused by inflammation. 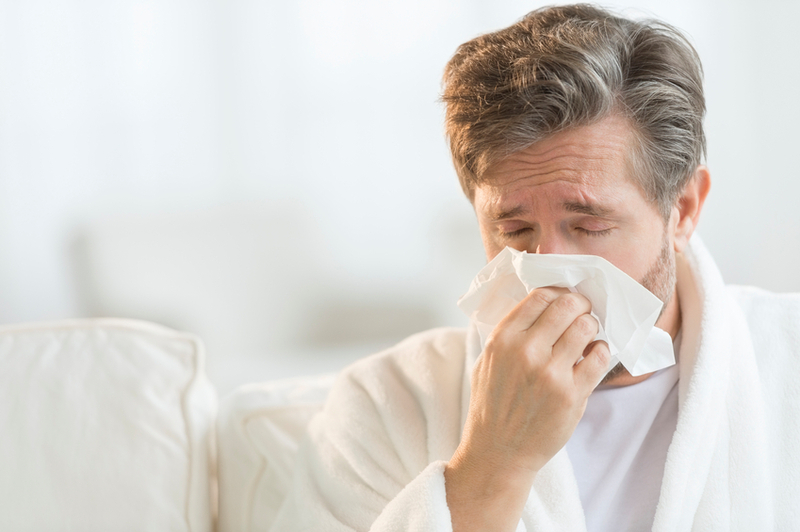 Often, when you catch a cold or have an allergy attack, it causes your sinus tissue to become irritated and inflamed. Once that tissue swells up, your nose is as blocked as if it was full of mucus. Some people find this even more frustrating than congestion because it seems as if there is even less you can do about it. No matter how often you blow your nose, it’s not going to clear out. In fact, blowing may make it worse because it keeps irritating the tissue. Acute sinusitis – the type of stuffy nose we’ve been discussing – is when your sinuses get congested or inflamed, but in a week or two (or three) they clear up and you can breathe again. But if your sinuses aren’t clearing up, or worse, you don’t have any other symptoms of a cold, flu, or allergies, you may need to look in your medicine cabinet. When you first felt your nose get stuffy, did you reach for an over-the-counter nasal spray? While there are so many reasons over-the-counter nasal sprays are bad for you, when you’re miserable, you aren’t necessarily thinking about your long-term health. You want to feel better and you want to feel better now. So, it’s understandable if you went down this road. Nasal sprays are supposed to work quickly and thoroughly – but nobody talks about their health concerns or the fact that they’re addictive! So much so that there’s a condition known as rhinitis medicamentosa, and it’s only cause is overusing nasal spray. This nasal spray rebound can happen with the very first cold. Eventually, your sinuses stop responding the way they’re “supposed” to and you find yourself reaching for the spray more and more, until you’re using it several times a day and getting more stuffed up in a shorter period of time. Luckily, you can relieve your stuffy nose, if it’s caused by mucus congestion, inflammation, OR nasal spray rebound, with any of these safe, all-natural solutions. 1. Get a humidifier. When your environment is particularly dry – like it may be when you’re heating your house in winter – your body responds by making more mucus to insure your nose stays healthy. Dry air can also cause the sinus irritation that leads to inflammation. But all that can make your nose stuffy. So get a humidifier, so your environment isn’t as dry, and your nose will be. 2. Use steam. Steam can help loosen mucus and make it productive, and soothe irritated inflamed tissue. If you take a hot bath, or breathe over boiling water, your stuffy nose will clear up if you just give it some steam. 3. Flush your sinuses. Not at all the same thing as a nasal spray, a saline flush can help clear out the mucus and ease the irritation in your nose. Use can use a saline spray, a Neti pot, or a bulb with saline solution. The key is to get a sterile saline solution into one sinus and let it drain out of the other, thus rinsing both sides. You can over-do a saline rinse, which will cause irritation in its own right, so hold this to once or twice a week until you’re feeling better. A stuffy nose is uncomfortable and unpleasant. No one can deny that. But you don’t have to live with it, and, if you manage it properly, it won’t stick around for long! ← Previous Post: SetraVida Ingredients: What’s in the SetraVida Formula?